I am Lori Gottlieb – surgeon, bicycling enthusiast, designer, jeweler, and owner of LoriMeg Designs. I strive to make well-crafted jewelry out of silver and gold that is energetic and versatile. Growing up, art was always a part of my life. At home, my mom always encouraged us to be creative, making cards (usually watercolors with ink drawings, which we called “minglings”), wall hangings, gingerbread houses, and cornhusk dolls. I was always dancing (I was in the Orlando Ballet Company on Long Island), playing the flute, or taking art classes, from ceramics to silversmithing. But I had other interests, as well. I loved science and the workings of the human body. After college, I went on to medical school and ultimately became a surgeon. I studied at NYU School of Medicine and I did my residency there, as well. I loved problem-solving, working with my hands and my head. And I loved the tangibility of my work…at the end of the day; I could generally tell you exactly what I had accomplished. Everyday brought a new challenge, which was very fulfilling. Even as I practiced surgery, I found time to pursue hobbies, such as ceramics and jewelry, taking classes at Baltimore Clayworks and Maryland Institute College of Art. I also started riding a bike, challenging myself to go longer and harder, often riding 40 or more miles at a time – a habit which I continue today. I was in practice for 15 years when I developed double vision and blurry vision – not a great thing for a surgeon! I underwent no less than 5 surgeries and numerous other treatments to help solve the problem with my eyes, to no avail. I faced a difficult quandary: what kind of meaningful work could I do? I decided to turn my jewelry-making hobby into a new profession. Here I could use skills I had honed as a surgeon, such as problem-solving and working with my hands. I could also be my own boss, working in the studio when my eyes functioned well enough, and planning new projects or handling other tasks when they did not. Early in the day, and late afternoons and evenings are most challenging for me due to the slow clearing of the ointment I use in my eyes at night, in the morning, and dryness in the afternoon and evening. 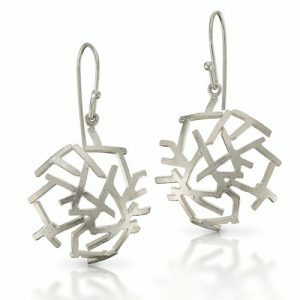 I have learned to design around my disability: I avoid straight lines, creating pieces that move in tandem with the body. 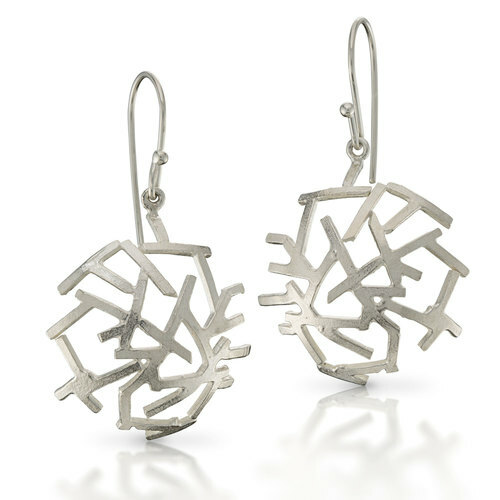 As Claire Patterson Blome wrote in an article for American Style magazine, “Lori Gottlieb’s organic jewelry pairs great attention to detail with the a total embrace of imperfection.” I think of most pieces as “sketches”. My goal is not to execute a perfectly straight line or capture a flower exactly as it blooms, but rather to be representational. Everything I do has some kind of movement and generally, some curves, which I find very sensual. So where do my ideas come from? Mostly, from the world around me on my bike. It’s as if there is a little camera in my head capturing images as I roll by – a little out of focus, with blurry edges. I love the layers of texture in the bark of a tree, the flutter of leaves, and the swirl of pebbles at the edge of a stream. I enjoy curves in the road, the bow of stems and branches, the sinuous path of rivers and streams. On vacation I take great pleasure in exploring the outdoors: stalactites and stalagmites, canyons and mountains, and beaches garlanded with seaweed. Natural elements spark ideas for my designs. My point of view is that you should project your best self everyday. My jewelry helps you do that! 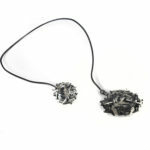 Put it on, feel the energy, feel the power of your individuality, just feel good! And if you feel good about how you look, you will bring that positivity to the rest of your life, empowering you to do great things!